Today in Masonic History Harland David Sanders is born in 1890. 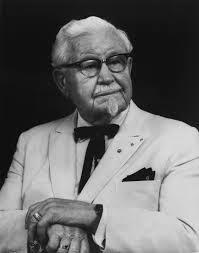 Harland David Sanders was an American entrepreneur and fast food icon. Sanders was born on September 9th, 1890 near Henryville, Indiana. When Sanders was 5, his father, who was a farmer and later a butcher after an injury left him unable to continue with the family farm, passed away suddenly. After his father passed away, Sanders was left to take care of his siblings while his mother traveled to work and would be gone sometimes days at a time. It was during this time that Sanders learned how to cook and became quite adept at it. In 1902, his mother remarried and Sanders did not get along with his new stepfather. Sanders would end up dropping out of school in the 7th grade and with his mother's permission move out of town. In 1906, Sanders forged his age on enlistment paperwork and served for less than a year in the United States Army. He would serve in Cuba. After his enlistment ended he moved to Alabama where one of his uncles lived. There he would get a job in the railroad industry and would work for various railroads over most of the next decade. He would later go into the life insurance business. He would study law through a correspondence course. Eventually being able to practice law in the state of Arkansas. All of those careers had ended in the same way, including his legal career. They ended with a brawl with a co-worker or in the case of his legal practice a brawl with a client in court. His varied career took him all over the country, including back to Indiana. Sanders then began a series of businesses which he owned and ran himself. This included a ferry company which was fairly successful. Sanders cashed in his stock from the ferry company, which he no longer ran, just a few short years later. He then started an acetylene lamp company, which folded fairly quickly when Delco introduced electric lamps. A chance meeting in 1924, with a representative from Standard Oil of Kentucky led Sanders to own a gas station in Kentucky. It closed though during the Depression in 1930. That same ayer, Shell Oil Company offered Sanders another gas station which they gave him for free in exchange for a percentage of the profits. He opened a restaurant with the gas station serving southern style cuisine. Sanders only competition was eliminated when he came after Sanders and a Shell representative with a gun. The competitor shot the Shell representative and was convicted of murder. The restaurant became very popular and Duncan Hines, a food critic, put Sanders restaurant in his Adventures in Good Eating book which was a guide to restaurants throughout the United States. He also added a motel to the operation until it burned down in 1939. In 1935, Sanders was made an honorary colonel by the Governor of Kentucky. It was in 1950 that he was "recommissioned" as a colonel and it was then that Sanders truly began to adopt the well known persona of Colonel Sanders. In 1939, Sanders acquired another motel, this time he ran it with his mistress and soon to be wife after he divorced his first wife. Through the 1940's the couple ran the motel and perfected his "special recipe" which included a faster way of cooking chicken in a pressure cooker. In 1952, he franchised his first "Kentucky Fried Chicken", a term that was coined by a sign maker working for Sanders' first franchisee. It wasn't though until Sanders turned 65 that he really started to sell his franchise. By 1964, the franchise had grown to 600 restaurants in several different countries including England and Canada. It was too much for Sanders and he ended up selling the franchise to an investment group in Kentucky. He retained the Canadian restaurants for himself. He moved to Canada and would remain a resident there until the time of his passing. Despite selling the franchise, Sanders maintained an influence over the company executives and franchisees who respected his culinary skills and, as The New Yorker once put it, "the force and variety of his swearing." Sanders passed away on December 16th, 1980. He was diagnosed with acute leukemia, although his official cause of death was pneumonia. Sanders was raised in Lodge No. 651 in Indiana and was raised in 1919. He would later affiliate with Hugh Harris Lodge No. 938 in Kentucky.